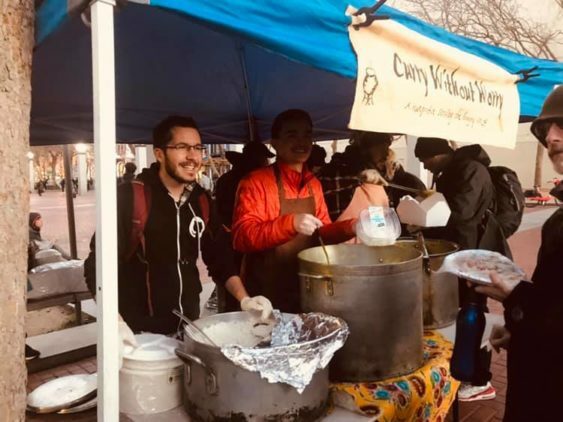 Rain or shine, Curry Without Worry will always be stationed at Hyde and Fulton in SF’s Civic Center serving free Nepalese food to drum beats and singing every Tuesday at 5:30 pm. What is Nepalese Food? Curry Without Worry generally will serve up plates with five different items like Nine Bean Sprouted Bean Soup, vegetable curry, rice, nan bread puri, Tomato and Timmur Chutney. As part of their philosophy, they not only serve the homeless, but they serve everyone who hungers to join them. And yes, the food is free, but… if you can afford it (and if you’re reading this post on your own computer or iphone, c’mon… we know you can afford it), donations are very much welcome. So feel free to wait in line and discover what Curry Without Worry’s idea of a hearty meal truly means. Updated 3/4/19 – Event info last checked via website.